Make a direct booking from our website and get 30% discount. 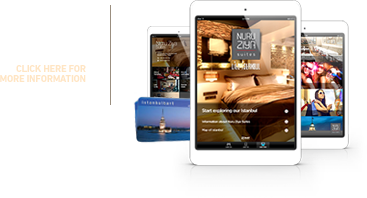 Provide your name and e-mail address to get special discounts up to 10% exclusively for guests who complete their reservations through Nuru Ziya Suites Website. The Best Available Rate is the announced price for the selected date/suite (including VAT and breakfast) . Best Available Rate offers a very high quality/price ratio and is continuously adapted to the market conditions to keep NuruZiya always ahead of competition. While making comparisons, please check the number of guests who can stay in a suite and always keep in mind that you have a private kitchen in your suite at NuruZiya. We promise that the total cost of stay will always be a very competitive one, and it’s needless to mention the joy of “lite life” in -NuruZiya which comes as a bonus. Below are the general policies we apply for reservation, modification and cancellation. Please be aware that these are necessary to keep our world class service offered in a sustainable fashion. If cancelled or modified up to 3 days before the date of arrival till 12 a.m. hotel time , no fee will be charged. If cancelled or modified later or in case of no-show, 100 percent of the first night will be charged. All reservations must be guaranteed with a Credit Card which is valid on the day of arrival. Hotel reserves the right to pre-authorize credit cards prior to arrival. Non guaranteed reservations are not accepted. We love them yet we regret that we can not allow pets to stay in NuruZiya. Late Check Out: Our check out time is 12 noon. Requests for late check out can be directed to the front desk a day before of your departure. Please be sure that we’ll do our best for you to enjoy your room for a few more hours , yet keep in mind that this may be subject to an additional charge. * All prices are inclusive of VAT and breakfast. © 2016 Nuru Ziya Suites - All right reserved.